The 1600mm version in Maple. The D3D Deskits range is constructed from continuous welded frames for strength and durability as well as aesthetic appeal. 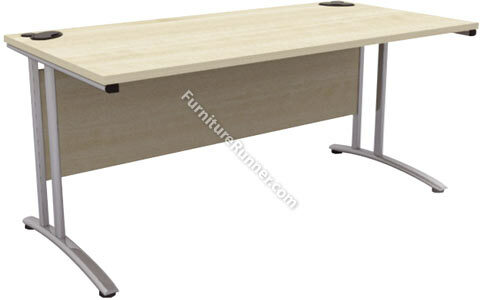 All D3K Deskits Desks have 25mm tops finished with 3mm high impact resistant polypropylene edging. Models features cable ports. Cable Trays and Leg Covers are available as optional extras. This desk is available in Royal Oak or Maple finish with Silver metalwork and can be used with under desk or desk high pedestals.